Ocean City, Maryland – (March 29, 2019): Spring has sprung in Ocean City, and as the town gets ready for warmer weather and the bustling summer season, residents can once again take advantage of Ocean City’s Spring Clean Up! This annual occurrence allows residential property owners to do their spring-cleaning by offering free residential bulk pick-up on Saturday and Sunday, April 6-7. Ocean City’s bulk pick-up service offers a convenient way for residents to get rid of large household items, such as furniture, appliances, bicycles, carpet, etc., which cannot normally be loaded into a standard refuse truck. Yard debris and shrubs are also permitted, however; the maximum diameter of tree limbs accepted is three inches. Further, this effort does NOT include the pick-up of full size trees or the pick-up of large demolition/remodeling projects. To participate, residents can place items curbside (staff does not go on private property to remove items) on Friday, April 5 for Saturday April 6 pick-up from 7 a.m. to 4 p.m. and Sunday, April 7 pick-up from 7 a.m. to 2 p.m. The Town is providing bulk pick-up free of charge during this period. At other times, cost for bulk pick-up is $20 per pick-up of one item, $30 for up to three items and $5 for each additional item. There will also be an amnesty program to collect fireworks, old ammunition and old weapons that residents may have in their household and need to be removed. 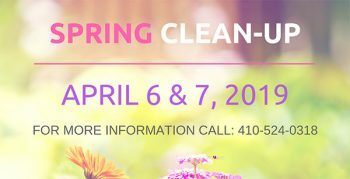 The Spring Clean-up service is provided for residents only, as commercial properties are not included in the Spring Cleanup effort. For more information, call the Town of Ocean City’s solid waste division at 410-524-0318.